Vietnamese food is such a vibrant cuisine. It is one of my favourites. It is homey and comfortable; yet, it can be so complex. Sometimes, it is hard to think outside of a bowl of pho noodles. 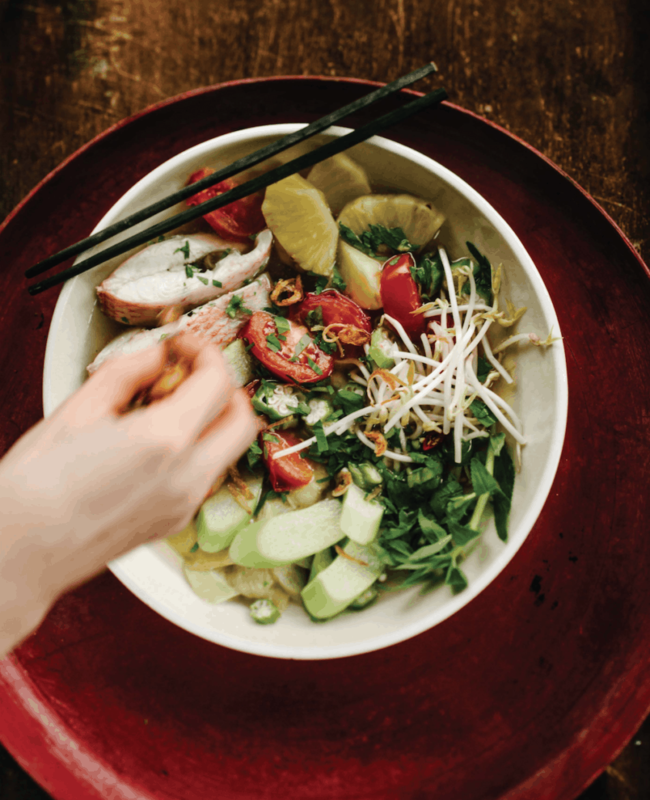 Kim Thuy’s cookbook Secrets of my Vietnamese Kitchen shares beautiful storytelling with simple and wonderful recipes that are full of flavour and easy to make. Reading her cookbook is like reading the Joy Luck Club all over again. There are over 50 delicious easy to make recipes to choose from in Secrets From My Vietnamese Kitchen. Every meal is an opportunity to show how and to be grateful for those who sit down and eat with us. A hot bowl of soup always seems fitting no matter the season. A hot bowl of soup is warming in the winter. While a bowl of sweet and sour soup is cooling in the summer. The longer you let the flavours infuse, the better the soup is. Spoon the tamarind paste into a bowl and cover with the boiling water. Let stand for 15 minutes. Pour the 6 cups (1.5 L) water into a stockpot, then add the fish sauce. Pour the tamarind paste and water mixture through a sieve into the stockpot. With a spoon, press down on the tamarind flesh to extract as much pulp as possible. Discard the seeds and residual pulp. Add the fish fillets to the broth and cook for 5 minutes. Remove the fish and reserve. Slice the pineapple lengthwise, then cut each piece into 1/2-inch (1.2 cm) thick slices. Add the pineapple and tomatoes to the broth and bring back to a boil. Add the okra and taro, lightly season with salt and pepper, and keep cooking for 2 minutes. Add the fish back to the pot, then stir in the bean sprouts, rice paddy herbs and cilantro. Bring back to a simmer, then remove from heat. Serve piping hot, sprinkled with fried onions or garlic, with bowls of bird’s eye chili and fish sauce dressing to dip the fish in. The longer you let the flavours infuse, the better the soup is. You can prepare it hours in advance and reheat it when you’re ready to serve. Garnish with reserved cilantro and green onions just before serving. This cookbook is a gem and every meal is so homey and comforting. Although some recipes take time to digest and perfect, but I would recommend this to anyone looking to bring more flavours to their kitchen. 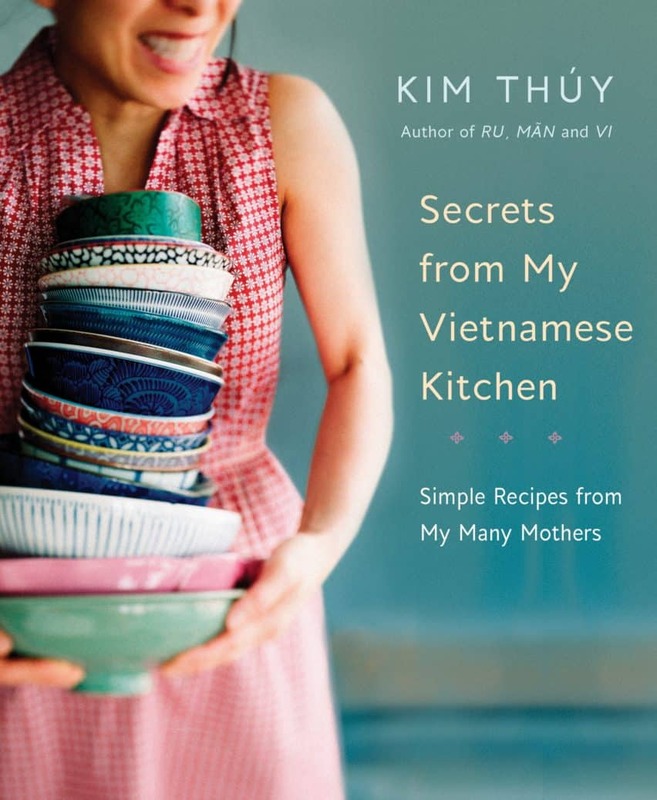 In this unique and inviting introduction to a vibrant cuisine, Secrets from My Vietnamese Kitchen offers more than 50 easy-to-make recipes from bestselling novelist and former restaurateur Kim Thúy. Seven extraordinary women, Kim joined by her mother and five aunts, share their stories and their culinary secrets, accompanied by stunning photographs, charming descriptions and evocative extracts from Kim’s novels. Starting with easily-prepared base ingredients of sauces, quick pickled vegetables and toasted rice flour, we move on to soups, sautés, vegetables, grilled foods, desserts and more. Sample recipes include Stuffed Squash Soup; Vermicelli Bowls; Caramel Pork; Calamari, Pork and Pineapple Stir-fry; Fried Lemongrass Fish; and Vietnamese Tapioca and Banana. Also, in collaboration with sommelier Michelle Bouffard, Kim suggests wine pairings for these Vietnamese dishes. Born in Saigon in 1968, KIM THÚY left Vietnam with the boat people at the age of ten and settled with her family in Quebec. A graduate in translation and law, she has worked as a seamstress, interpreter, lawyer, restaurant owner, and commentator on radio and television. She lives in Montreal and devotes herself to writing. SHEILA FISCHMAN is the award-winning translator of some 150 contemporary novels from Quebec. In 2008 she was awarded the Molson Prize in the Arts. She is a Member of the Order of Canada and a chevalier of the Ordre national du Québec. She lives in Montreal. MARIE ASSELIN is a food writer, translator, recipe developer, stylist, and culinary teacher who is based in Montreal.